When I talk to clients about what marketing technique usually gives them the best return on their investment, they are often shocked to discover that it’s their email list. A targeted and high-quality email list is one of the most valuable assets that a business can have. It enables all kinds of email marketing, allowing them to reach out to already existing or potentially interested customers with all kinds of marketing content, ranging from digital newsletters, to new product announcements, to marketing campaigns. An email list isn’t something that you can just buy off the internet (well, you can, but please don’t)! An email list is really something that your business needs to develop itself. You want a list that is full of people who are actually interested in what you have to offer. But how do you do it? By using Opt-Ins! Is your email list looking a bit sparse? It’s time to build it up by using opt-ins! Put simply, an opt-in offer is an incentive. It is a reason why a visitor to your website should give you their email address. Thanks to copious amounts of spam and unwanted emails out there today, people are more reluctant than ever to share their email address with anyone. So, you have to sweeten the pot! Opt-in offers can be just about anything, ranging from informative whitepapers, to ebooks, to checklists, to exclusive coupons. For your opt-in offers to be effective, you need to make sure that the free content you are sharing is actually “worth” their email address. This is one of the reasons why so many companies hire a virtual assistant to ensure that their content is of top-notch quality. If the “free content” that someone signs up for turns out to not be worth it, that new subscriber is going to be hitting that unsubscribe button before you know it. Pop-ups have come a long way since the early days of the internet. Back then, a brand-new window would appear on your screen and start playing a video, or music, or have loud flashing graphics. This disrupted your browsing experience and annoyed users, which is why pop-ups got such a bad name. Today, pop-ups can unobtrusively be used on your website to entice viewers to sign up for your email list. It could simply be a small pop-up in the bottom corner of a page that can be easily dismissed. You can also use exit intent pop-ups that will appear when it looks like a viewer is about to leave your website. As they were about to leave the site anyway, exit intent pop-ups don’t disrupt the customer’s browsing experience. Some of my clients ask me the difference between social media and email, from a marketing perspective. I think of it like this… When someone goes onto Facebook or Twitter and checks your profile, they are “checking out your display window” you. Just as you window shop when you hit the shopping mall, potential customers are interested in your “digital storefront display” to see if what you offer is interesting to them. They are initiating the contact. But when you have someone’s email address, you can “visit” them, giving you a greater measure of control over the experience. With an email list, even if your customers leave a social media channel, you can still have contact with them because you have their email. Having someone’s email is much more valuable than having them as a follower on social media (although that is also important). That said, you can leverage social media to grow your email list. By utilizing Facebook Ads, you can bring people to your website or sales landing page, putting your offer of free content in front of them. With Facebook (or other social media) ads, you can target specific demographics and locations, allowing you to pick the exact audience you want to connect with. You can also add a free opt-in right in your social media cover and bio! One of your business’ most valuable assets is your email list. Have you used opt-ins? If you are trying to entice people into signing up for your email list by using valuable content, where would be a good place to ask them for it? How about… in your content! Blog posts are an incredibly useful form of free content, but they are rarely used as an opt-in. This is because a) there is a public perception that blog posts should be free and b) they are much more useful for content marketing purposes and building SEO. That doesn’t mean you can’t use them to build your email list though. If someone reads and enjoys one of your blog posts, they are likely going to want more. If you offer them a free opt-in that supports the subject they were just reading about, right at the end of the blog, there is a good chance that they will sign up for it. Example: When I write a blog post about social media marketing, I like to include an opt-in that gives the reader 15 free visual quotes to use on their social media channels. (It’s one of my most popular opt-in’s)! By building opt-in opportunities into your blog posts, you can prove to your customers that the exchange of email for further content will be well worth it. Opt-ins can be tricky to effectively design. You can’t just say “Gimme your email!”, or use marketing jargon. You need to make sure that it is a genuinely enticing offer. It needs to be a fair exchange and one that they won’t regret it after they’ve signed up. The best way to do this is to ensure that the content you are sharing is high-quality. As a virtual assistant, I’ve created both the opt-ins and the content for hundreds of companies. 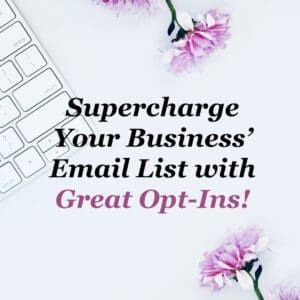 I know exactly how to grow your email list to make it into one of the most valuable resources you have available at your fingertips. Contact me today and we can get started creating opt-ins that will draw in your customers and generate new leads!